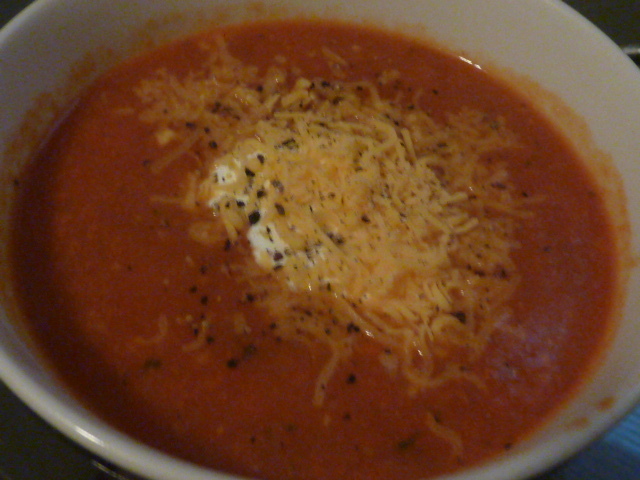 Though I already have a recipe posted for a healthy tomato soup, I wanted to make another version that is a bit easier. First, I decided to skip the usual step of blanching the tomatoes. While it lends a bit to consistency, it isn’t absolutely essential. Second, I decided to make use of a slow cooker, which makes the process very hands off, with the exception of processing the ingredients toward the end. Though most tomato soup recipes call for water or chicken broth as the base, I prefer to use beef stock in a tomato soup. It adds an additional depth of richness and comfort that pairs well with the brightness of fresh summer tomatoes. 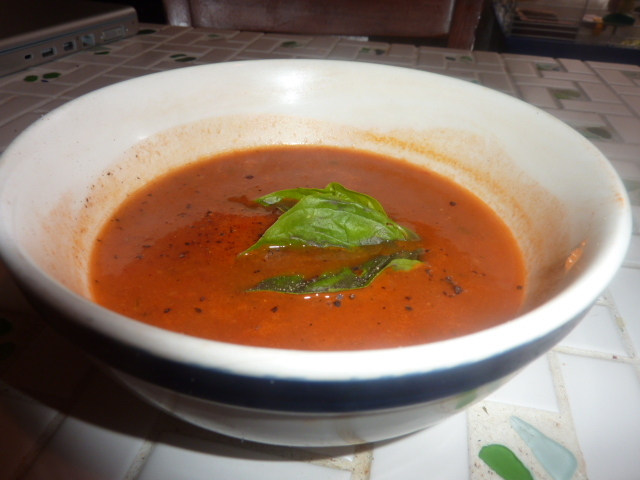 The basil adds another layer of delicious, herbaceous flavor and really knocks this super-simple soup out of the park. If you’re a fan of rich, hearty tomato soup but don’t like the idea of all of the sodium and additives in a can or the fat and calories that come from cream or a rue¹, this version is absolutely perfect for you. Set slow cooker to high. Add olive oil, onions and bay leaves. Season with kosher salt and freshly cracked black pepper. Let cook, covered, about an hour until lightly caramelized. Add beef stock, tomatoes, and basil. Cover and let cook at least 4-6 hours. Remove bay leaves. Transfer contents of slow cooker, working in batches if necessary, to a food processor or blender. Blend until mostly smooth or desired consistency. Return to the slow cooker and switch setting to low. Stir in tomato paste and red wine vinegar. Taste for seasonings and adjust as necessary. Simmer another hour or so until thickened. Serve. I really love tomato soup. I am not, however, a fan of heavy cream or loads of butter, so I devised this much healthier and just-as-tasty version. It turned out to be wonderfully flavorful and quite filling. For a more filling option, pair this with some homemade croûtons or a grilled cheese. In a large saucepan, heat olive oil and Brummel & Brown over medium heat Brummel & Brown is melted. Add garlic and onion and sauté until onion is translucent, roughly 3 minutes. Add carrot and celery and sauté until carrots are tender, roughly 3 more minutes. Add baking potato and season with salt and freshly cracked pepper to taste. Sauté another 2-3 minutes. Add tomatoes and sauté until heated through, roughly 3-4 minutes. Add pork/beef stock and reduce heat to maintain a simmer for 15 minutes or so. Season with garlic flavored hot sauce and dried parsley. Taste and adjust seasonings as necessary. Transfer to a food processor and blend until desired consistency. I prefer a consistency that has a little bit of a chunky texture but is mostly smooth, which I accomplished by running the food processor for about 30 seconds, scraping down the sides, and then pulsing in 1 second bursts another 10-15 times. It may be necessary to do this in batches, so be aware of your “liquid maximum” line. Return to pan to reheat if necessary. Serve garnished with sour cream and shredded cheddar cheese to taste.